The wiring duct market in different regions across the world is undergoing diverse phases. North America and Europe are mature regions of the global wiring duct market, due to presence of large-sized telecom and commercial sectors in these regions. On the other hand, developing countries in Asia Pacific and Middle East & Africa, which are witnessing modernization and adopting industrial automation to upgrade industrial processes, are witnessing increase in the demand for wiring ducts. This, in turn, is driving the global wiring duct market. The global wiring duct market is projected to expand at a CAGR of 4.6% during the forecast period and reach value of US$ 524.3 Mn by 2027. There exists high demand for industrial automation process controls worldwide. This helps in reducing manual labor inputs and decreasing costs. SCADA, DCS, Process Instruments, etc. have made industrial automation more reliable and powerful. As industrial automation develops and becomes more complicated, more sophisticated control technologies emerge. Furthermore, this leads to increase in complexity during interconnecting of system components from sensors to top-level controllers. In order to maintain complexity, wire and cable ducts are required for routing and concealing large bundles of wires and cables in control panels. This, in turn, is likely to boost the global wiring duct market during the forecast period. However, environmental concerns regarding recycling and disposal of ducts is a major factor that hinders the global wiring duct market. PVC is the most common type of ducting material used in wires and cables across different industries. It is also widely used as an insulating or jacketing material for wires used in various applications. However, PVC is not an eco-friendly chemical. Hence, disposal of wiring ducts made of PVC is a major issue. Since PVC is not naturally degradable, burning of PVC releases a large amount of highly toxic dioxins. These dioxins enter the human food chain by contaminating land and water. Moreover, introduction of halogen-free wiring ducts is expected to create lucrative opportunities for the market during the forecast period. This factor would continue to drive the global wiring duct market during the forecast period. Among applications, the commercial segment is expected to dominate the global wiring duct market during the forecast period, owing to high demand of wiring and cabling ducts for use in IT hubs, network cabling systems, data centers, telecom industry, office spaces, hospitals, and other retail complexes in order to organize large bundles of cables and separate them from raceway in an electric enclosure. IT hubs, telecom industry, and data centers are expanding at a high pace currently. This is expected to augment the demand for wiring ducts during the forecast period. The commercial segment is likely to be followed by the industrial segment. Furthermore, high demand for wiring ducts in industrial applications, especially in oil & gas industries, chemical plants, and grain elevators, is expected to propel the global wiring duct market during the forecast period. Attracted by growth of the market and underlying latent demand for wiring ducts, several players operating in the global wiring duct market are expanding their business through new product development, strategic mergers and acquisitions, and partnerships. In June 2018, Hager Group introduced IBOCO’s standard-finger PVC wiring duct. It is around two meter in length and it contains a lid with a protective film. The new product is expected to reduce efforts of installation. Some of the prominent players operating in the global wiring duct market are ABB Ltd, Hager Group, Panduit Corporation, Hua Wei Industrial Co., Ltd., OMEGA Engineering, Inc., Phoenix Contact GmbH & Co. KG, and Hammond Manufacturing. Market players are focused on expanding their business through strategic acquisitions and partnerships with several end-use industries. The report includes detailed value chain analysis, which is focused on providing a widespread view of the global wiring duct market. The value chain analysis section includes a list of active market participants, marketing channel analysis, and market positioning. The report also includes wiring duct production analysis and forecast as well as the manufacturing cost analysis. Porter’s five forces analysis has also been provided in the report to help understand the competition scenario of the market. The study incorporates market attractiveness analysis, wherein product and application segments have been benchmarked based on their market size, growth rate, and attractiveness. The report also includes attractiveness analysis of the market in every region in order to help understand the competition scenario of the market. 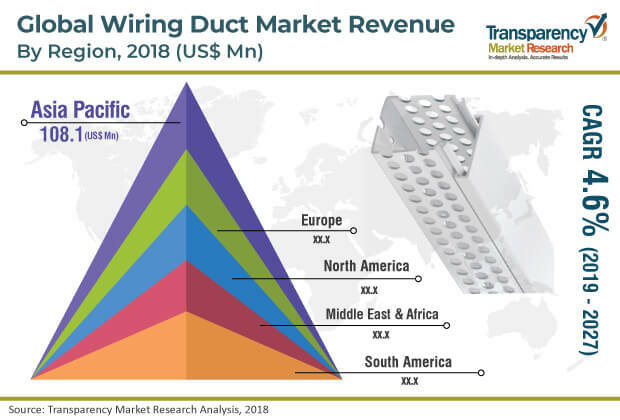 The overview section of the report analyzes market trends and dynamics that include drivers, restraints, and the current and future opportunities for the global wiring duct market. Market outlook analysis has also been provided in the report. Additionally, the report offers analysis of business strategies adopted by key players operating in the global wiring duct market. The introduction chapter provides a snapshot of different trends in the global wiring duct market. In terms of product type, the global wiring duct market has been segmented into slotted wire duct, solid-wall wire duct, flexible wire duct, and others (including DIN rail ducts). Furthermore, the slotted wire duct segment has been sub-divided into wide-slotted wire duct, narrow-slotted wire duct, and round-hole wire duct. Based on application, the market has been divided into commercial and industrial. The commercial segment comprises wiring ducts used in IT hubs, network cabling systems, data centers, telecom industry, office spaces, hospitals, and other retail complexes. The report provides region-wise segmentation of the global wiring duct market and categorizes it at various levels, thereby providing valuable insights at micro and macro levels. The report also highlights the competition scenario of the global wiring duct market, thereby ranking all major market players according to their geographical presence and key developments. Insights for the global market is a result of extensive primary interviews, secondary research, and in-house expert panel reviews. The market estimates have been analyzed by considering the impact of different economic, political, social, legal, and technological factors. In terms of country, the market in North America has been classified into the U.S., Canada, and Rest of North America. The Europe market has been categorized into Germany, France, the U.K., and Rest of Europe. The Asia Pacific market has been segmented into China, Japan, Taiwan, South Korea, and Rest of Asia Pacific. Middle East & Africa covers GCC, South Africa, and Rest of Middle East & Africa. South America comprises Brazil and Rest of South America. This report provides all strategic information required to understand the global wiring duct market along with product and application segments of the market. Additionally, the report provides insights into the market across all regions. Primary research involves telephonic interviews, e-mail interactions, and face-to-face interviews for detailed and unbiased reviews of the wiring duct market across different regions. Primary interviews are usually conducted on an ongoing basis with market experts and participants in order to obtain the latest market insights and validate the existing data and analysis. Primary interviews offer new information on important factors such as market trends, market size, competition landscape, and growth trends. These factors help validate and strengthen secondary research findings. Moreover, the data collected and analyzed from secondary and primary research is discussed and examined by TMR’s expert panel. The research study includes profiles of leading companies operating in the global wiring duct market. Market players have been profiled in terms of attributes such as company overview, financial overview, SWOT analysis, business strategies, and recent developments. Key players operating in the global wiring duct market are ABB Ltd, Hager Group, Panduit Corporation, Hua Wei Industrial Co., Ltd., OMEGA Engineering, Inc., Phoenix Contact GmbH & Co. KG, and Hammond Manufacturing. These companies focus on expanding their business through strategic acquisitions and partnerships with several end-use industries.